PowerWood Corp. Log Home Building Materials - PowerWood Corp.
PowerWood can provide home builders with cedar material for full-log home construction. 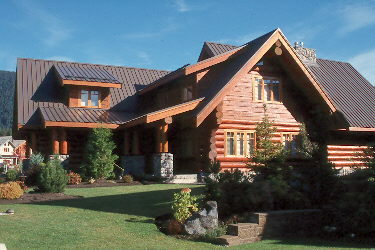 Likewise, we can provide log siding, which is an effective way of duplicating the look and feel of a true log home. That’s because PowerWood’s premium log siding is developed for applications on frame-built structures where a real log appearance is desired. It can be easily applied to new or existing frame structures with minimal construction experience. Basically, with our custom log siding, any home can be built or remodeled to look just like the kind of beautifully rugged structure Grizzly Adams would be proud of. Also have a look at our complimentary product for log home building materials, Cedar Timbers.